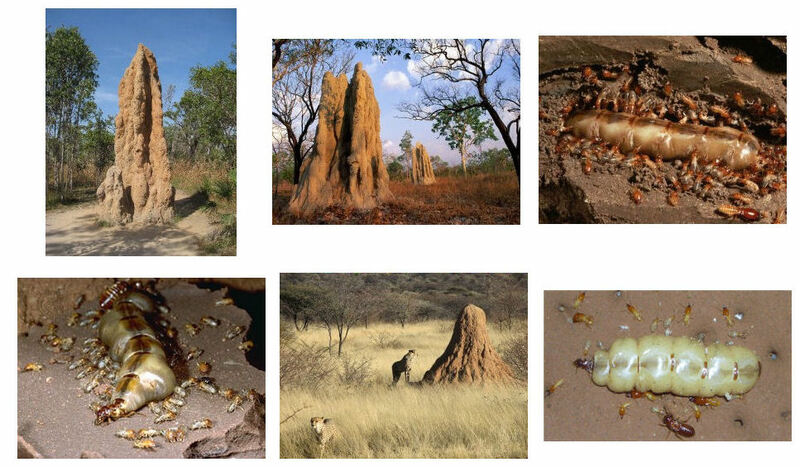 A termite queen can live up to 45 years, captive in her huge mound where she lives. She can pump out around 20000 to 30000 eggs per day which will amount to a huge number of offspring! When the termite queen’s life is at its end, her children gather around her and lick her to death by drawing fluids out of her body. Such ingratitude. Termites are insect workaholics. They work 24 hours-7 days a week without stopping and do not sleep. In Singapore, termites are considered an exotic delicacy. The termites are preserved in rice wine or served live to intrigued customers. It is said to be tough on the outside but cool and creamy on the inside. When there is a breach in their termite mound, the dutiful soldier termites will bang their large heads against the walls to attract other soldier and worker termites for defense. Almost all the worker and soldier termites are blind as they spend all their time in their dark, dusty mound. Reproductive termites, however, possess functional eyes as they need to fly in search of new nesting grounds. Some above-ground mounds can go as high as 9 meters! That is higher than a single-storeyed house. Typical mounds are around 2 to 3 meters.